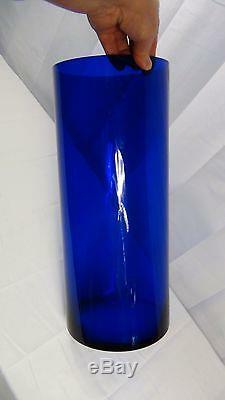 VINTAGE CYLINDRICAL HAND MADE ROYAL BLUE TURQUOISE BLENKO COBALT VASE LARGE FORM WITH STRAIGHT SIDES AND SANDED RIM LIMITED EDITION. CONDITION GOOD;MINOR WEAR AND IMPERFECTION. 17"H x 7"DIAM. 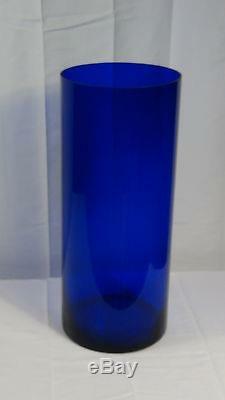 The item "VINTAGE HAND MADE CYLINDRICAL LIMITED EDITION WithSANDED RIM BLENKO COBALT VASE" is in sale since Saturday, December 26, 2015. This item is in the category "Pottery & Glass\Glass\Art Glass\North American\Blenko". The seller is "silkboxing" and is located in Renton, Washington. This item can be shipped worldwide.